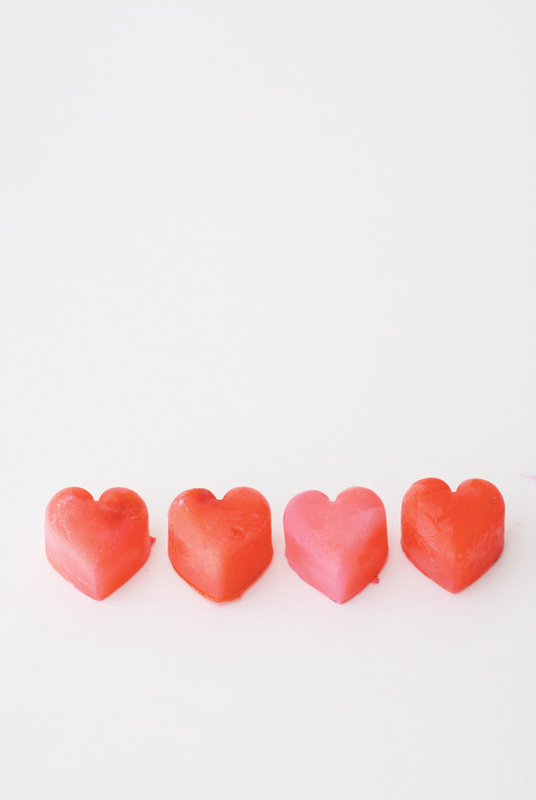 Inside: Make these sweet Valentine milk ice cubes for your Valentine bash with the cutest heart ice cube trays! With Valentine’s Day quickly approaching, I am excited to share a couple Valentines hearts projects to celebrate the holiday with subtly and style. 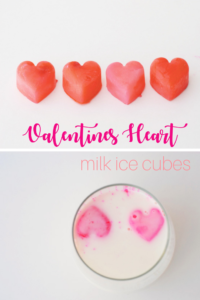 These Valentine’s hearts milk ice cubes are a sweet surprise for your man’s morning coffee or the kid’s tall glass of milk, they are so simple to make! I made mine with the cutest heart ice cube trays ever!. As they melt, the milk turns pink (the twins were in love!). DIY Valentine decorations, individual mini fondue, sweet love brownies these would pair perfectly with our milk ice cubes! Stitched hearts (these would make adorable Valentines), crocheted heart cake toppers and one of my first DIY blog posts painted love bottles. I used this heart ice cube tray from Ikea to make my ice cubes! They are so simple and you can make them for any and every holiday! 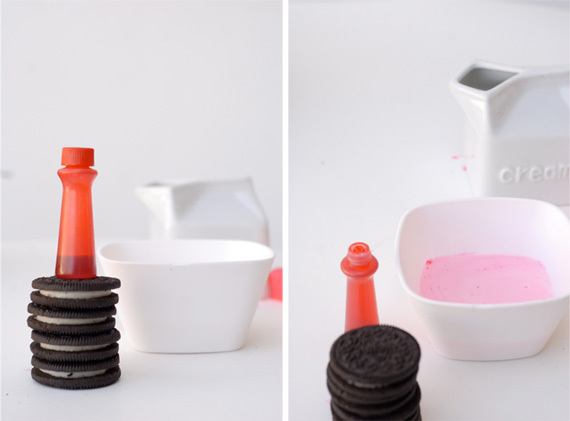 Start by combining milk and a few drops of red food coloring together in a small bowl. 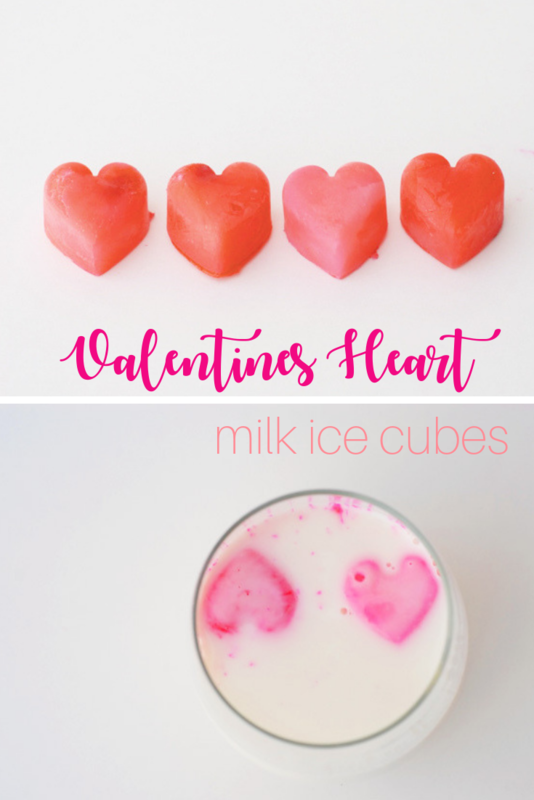 These Valentine’s hearts milk ice cubes are a crazy easy way to make the morning special for those you love. Since Valentine’s Day usually falls on a weekday for us, I am always on the lookout for simple and easy ways to make it special while still getting everyone out the door on time. Over the years, I’ve come to learn that even the simplest acts of celebrating a holiday have come to mean a big deal to the idea of traditions for my kids and my husband. It’s so worth it to take a moment and create something like these heart ice cubes that they will remember fondly years from now. This Valentines milk ice cubes idea could also be used with red wine to add substance to Valentine’s dinner or soup. The trays could also be filled with chocolate for adding a sweet taste to any drink (I like the chocolate hearts best with pink lemonade). And you could harden whipped cream or frosting in the Valentines hearts to top Valentine’s cake in festive holiday style. So get your heart tray out, and fill it to begin making festive Valentine traditions today. Such a cute idea! I love all things heart-shaped! this is sooo stinking adorable! love it! you are always soo creative!! Adorable! I love this idea. Can’t wait until I have kids – they will enjoy this! I love all of your creative ideas! Sweetest idea! And pink milk afterwards?! What could be better. These are absolutely adorable. Thank you for sharing Victoria! This is such an amazing idea! My kids will go crazy for this. Thank you so much for sharing! Thanks for sharing such an adorable idea! I like the way you think! Oh I so will be making these for my twins! Bumped into your site would love to share these milk cubes with my readers, may I have your permission to post and link back to you? I wonder if you could make Strawberry Quick and freeze it in the ice cubes? Then it would be strawberry tasting as they melted. Yes, Sharon you could totally use strawberry milk. I originally made these to put in coffee and thought it would be great to have them without taste, but in the milk that would be perfect! so cute. what a simple and sweet idea. 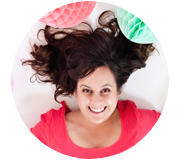 your ideas were so inspirational, we shared with our readers. thanks so much for sharing. you are truly talented. Cute idea! Can’t wait to make these for other special occasions too! Such a cute idea! I was going to order some heart cube ice trays online now I know they’re at Ikea. Thanks for sharing! 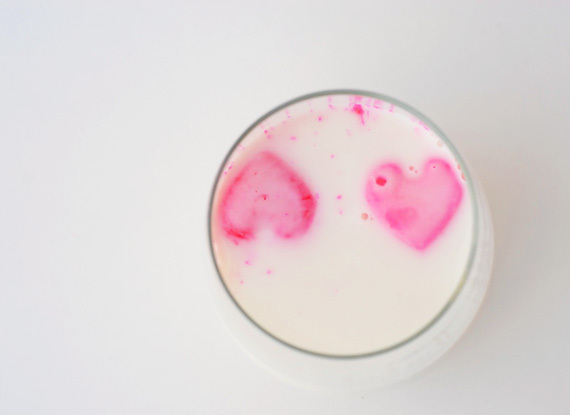 you could also use strawberry flavored milk for pink hearts. Such a cute idea! I shared it on my business fan page with a link back to you. I think it would be perfect for an after school Valentine’s snack! 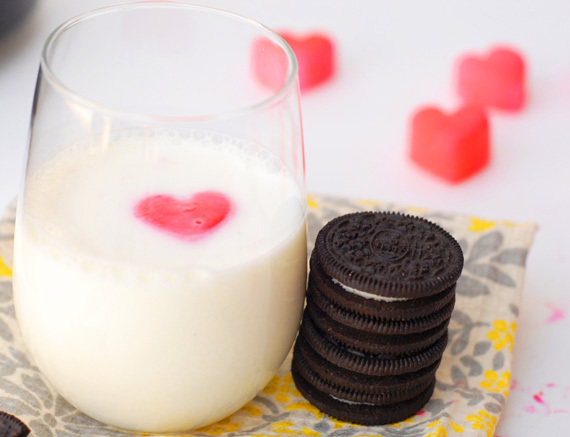 I’m planning on making a “milk and cookies” dessert for my boyfriend for V-Day, since we’re not big on holidays. I’ll be making Chocolate Chip Cookie Dough Truffles and Oreo Truffles, with a side of milk and cute pink ice cubes. It’ll be great! 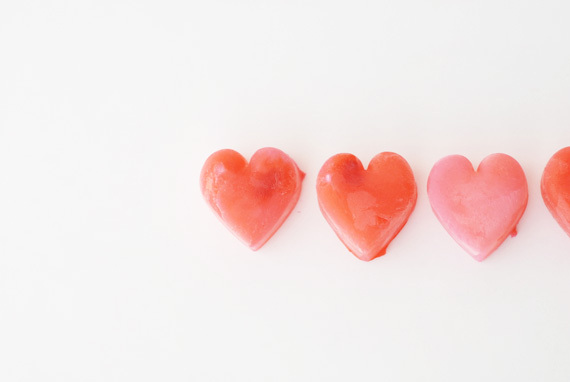 Pingback: Top 10 Valentine’s Day Treats | Go Valley Kids: Your Guide to Kids Activities in the Fox Valley, WI. Pingback: Weekly Favorites | Trying for Baby S.
Pingback: 10 Pinterest Picks for Wedding Decorations & More! These sound yummy and healthy! I’ll have to order the ingredients from my organic food store online! Oh my gosh, this is the cutest idea ever!!! !